Ghosn's Drive the Future plan for Renault amplifies the automaker's current strategy. Renault CEO Carlos Ghosn has laid out a relatively conservative strategy that counts on volume growth in international markets while reducing the automaker's reliance on Europe to drive profits until 2022. Under the new plan, called Drive the Future, Ghosn is aiming for annual group revenues to reach 70 billion euros -- a 40 percent gain over 2016 -- with an average operating profit of 7 percent, compared with 6.4 percent in 2016. He will reach those targets by increasing volume 40 percent to 5 million vehicles annually from sales of Renault, Dacia and Lada models, with 60 percent of all sales coming internationally, including an increase in Chinese sales to 550,000 annually. Last year Renault sold 35,000 vehicles in China. "It's a plan of growth," Ghosn said last month. "Drive the Future is about building up profitable and sustainable worldwide growth that is geographically well distributed and balanced between market segments." Europe will recede in importance, though it will remain a "profit pillar," Renault says. Sales here are expected to be flat over the course of the plan, at 1.8 million units annually, and models sold in Europe will have higher-cost features to meet stringent emissions standards and advanced driver-assistance systems. "If you don't have growth in other regions, you can't finance the technology in Europe," said Ronan Noizet, senior analyst for European light vehicle production at IHS Markit in Paris. Renault will also double its battery-electric vehicle offering to eight and plans to electrify half its lineup with hybrid technology. At the same time, it will simplify its internal combustion engine lineup by reducing the number of diesel engine families to one. At a time when the auto industry is facing a period of sharp change to offer autonomous, electric and connected vehicles in the future, Ghosn is amplifying Renault's current strategy rather than taking the company in a radically new direction, analysts said. That is a reflection of Renault's earlier investments in electrification and operations in high-risk/high-reward markets such as Russia, India and Brazil, they said. "He’s keeping the course," said Xavier Caroen, an analyst at Bryan Garnier in Paris. "He's not changing strategically, but that's because Renault's current trajectory will allow him to get through this while others will need to take risks to adapt to this new world." Renault has spent years and invested billions to build its international footprint, and is now primed to see that patience pay off. In Russia, for example, it absorbed hundreds of millions of euros in losses on AvtoVAZ, which makes the Lada brand, as the overall market fell by more than half from a peak of nearly 2.75 million passenger vehicles in 2012 to 1.3 million sales last year. Russia is now in recovery and could top 2.18 million units by 2021, according to a report from PwC. Renault could benefit disproportionately from that growth, as Lada holds a 20 percent market share and the Renault brand has a 9 percent share. AvtoVAZ is now fully consolidated into Renault's balance sheet, and Renault executives say the division is very close to breakeven. "Even a flat market in Russia would not negatively alter the profitability of AvtoVAZ because the restructuring has been done," Caroen said. Similarly, Renault has built a potentially strong operation in Iran, where it will introduce four new vehicles in the next five years. In August, the company invested 660 million euros in a joint venture to set up a plant in the city of Saveh that will is expected to produce 300,000 vehicles annually by 2022, giving Renault a total production footprint of 500,000 units. Last year, Renault sold about 120,000 vehicles in an Iranian market with total sales of 1 million. "Iran has a huge potential," said Marc Suss, the head of Renault's program for low-cost vehicles, "We think it can pass 1.5 million." But it is in China, the world's largest vehicle market, where Ghosn hopes to reap the biggest rewards. Renault will launch seven vehicles there by 2022, including three full-electric vehicles and a new compact SUV. The automaker has just entered into a partnership with Brilliance China Automotive to develop and produce light commercial vehicles (LCVs). "China is our priority No. 1," said Stefan Mueller, Renault's chief performance officer. Analysts said, however, it may be difficult for Renault to reach its goals in China, where overall growth is slowing and domestic automakers are undercutting European joint ventures on price, especially in the lucrative SUV segment. Renault's joint venture with Dongfeng includes the Captur, Kadjar and Koleos SUVs and will add an electric version of the subcompact Kwid crossover. "The Chinese SUV segment continues to see growth in China, but growth rates are a far cry from what they once were," said Namrita Chow, principal analyst at IHS Markit in London. 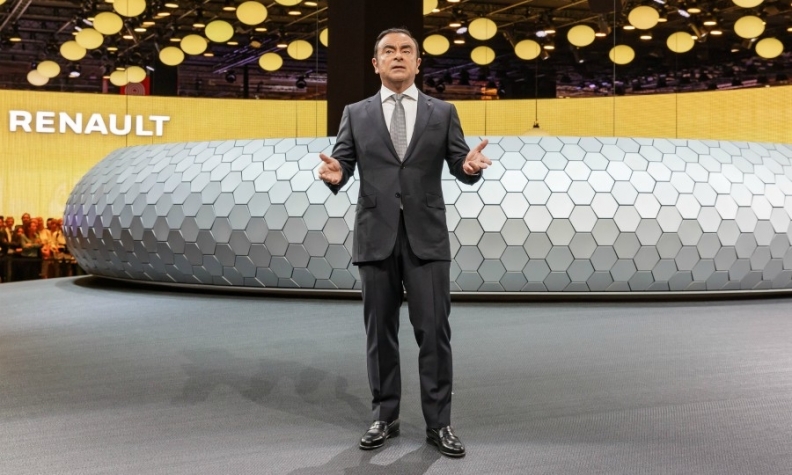 IHS forecasts that Renault's China sales will be a little under 200,000 units in 2022, but this does not include LCVs from the new Brilliance partnership, Chow said. For years, Renault was virtually alone in selling full-electric vehicles in Europe with the Zoe, which is now the market leader. As companies such as Daimler and Volkswagen Group announce big investments in electrification to meet emissions standards, Renault will be able to enjoy profits, analysts say. The group says it has already achieved a profit on variable costs [which excludes r&d investments], and will turn a profit with its EVs before the plan concludes in 2022. "They have already amortized part of the 4.5 billion to 5 billion euros already spent on electric vehicles, while others are only just now investing in this technology," said Caroen of Bryan Garnier. Renault will offer a total of eight full-electric models, which will cover 80 percent of the market. 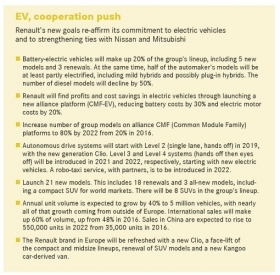 Costs will be controlled through the introduction of a new CMF-EV platform developed by the Renault-Nissan-Mitsubishi alliance that will be used for 80 percent of the French automaker's EV volume. "Our new competitors will have start-up pains," said Gilles Normand, director of Renault's EV program. "We can accelerate." The foundation of Renault's new plan may be based on growth, but the group is also preparing to introduce autonomous-drive features and mobility services including a robo-taxi service, Ghosn said. The company will spend 18 billion euros on r&d over the life of the plan to develop "technology bricks" such as a new common cloud platform for data management. By 2019, the company will offer Level 2 autonomy features starting with subcompact vehicles such as the Clio, and by 2022 will have launched 15 models with Level 2 to Level 4 (eyes-off) autonomy, the CEO said. "It is a challenging and exciting road ahead," Ghosn said. "The auto industry will go through more changes in the next 10 years than it has ever seen in the past."